Weinfests are almost as popular as the Oktoberfest in Germany. The country actually lies thick with vineyards. They are within the sight of Bonn, Beethoven’s city and Germany’s former capital. They remember Roman footsteps near the amphitheater at Trier and they hear Mercedes-Benz engines hum at Stuttgart. There are vineyards at Heidelberg, Worms and Würzburg, near the spa at Baden-Baden and even in the alpines around Lake Konstanz … and lots of wine garten to enjoy a Riesling, Silvaner or Grauburgunder in the open air. Between August and October, you can visit approximately 1,250 wine festivals in Germany every year that are as as diverse as the products they celebrate! Some date back nearly 500 years. The largest Weinfest takes place in Bad Dürkheim in September, where up to 300 vineyards sample and sell their latest creations. 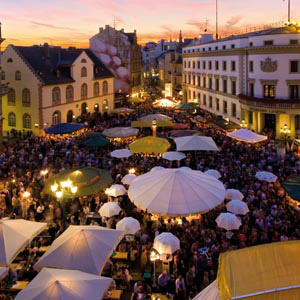 The “Rheingauer Weinwoche” in downtown Wiesbaden in August is also known as the “world’s longest wine bar.” Other festivals take place in the courtyards of ancient castles, in village squares, on vineyard slopes and in city streets. However, no matter where they are held, all celebrate the harvest of high quality German white and red wines that are enjoyed throughout the world. Weinfest are a big deal for vintners. Hundreds of small wine towns along the Rhine, Main, Neckar or Danube feature elaborate parades of costumed brass bands. One of the highlights is the crowning of a “wine queen” who becomes the spokesperson for the region’s vintners at official events. The spirit is further enhanced by displays of antique wine as well as growing and processing equipment and colorful floral arrangements. 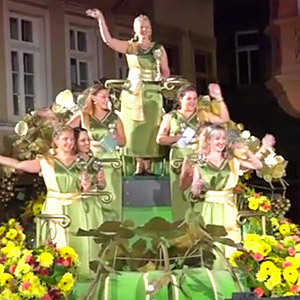 Watch the festive reception of the wine queen from Bernkastel-Kues, located in the Central Mosel Valley. The food is, as always, is of course plentiful! 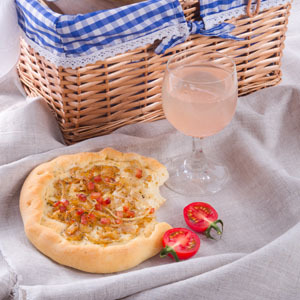 One of the regional specialties in from the Mosel to the Black Forest are Federweisse mit Zwiebelkuchen (freshly fermented wine with onion tarts). Yet, sausages, pretzel, cheeses, roast with spaetzle noodles are equally paired with the white and red wines of the region. In the Frankenland (Franconia in Northern Bavaria), you can find delicious wine jellies made from the regional red wine “Regent” or rose wine “Rotling. All these specialties, prized by Germans and non-Germans alike, play a very important role in the celebrations. After all, what is good wine without a pairing of good food!